A team of Xavier University faculty and students is testing the waters in Costa Rica. The group, in tandem with Gary Morgan of Morgan's Canoe & Outdoor Centers Inc., will establish a research station at Morgan's Jungle Lodge and Center for Rain Forest Education on Costa Rica's remote Osa Peninsula. "We will be setting up baseline data-collecting projects that include stream quality, monitoring baseline data on four rain forest streams, plus primate surveys and hummingbird surveys," Morgan explained. The 16 students, along with two professors and their wives, left Cincinnati on Thursday with Morgan. They flew to San Jose, Costa Rica, and then took a small plane to the country's southwestern coast. They will spend two weeks laying the groundwork for research and will return just in time for the start of classes Jan. 14. For XU biology faculty members Brent Blair and George Farnsworth, it's an exciting opportunity to bring tropical ecology to life for undergraduates, building on the success of a rain forest biodiversity class they offered for the first time this fall. "This is a hands-on research experience for students, looking at tropical ecology in the tropics, doing experiments they would normally only read about," Blair said, adding that the co-author of the textbook he and Farnsworth used last fall lives only a mile from Morgan's Jungle Lodge. Farnsworth said he and Blair gave their students an assignment to complete before takeoff: Each had to write a short paper and make a presentation in preparation for the work they will be doing. For Morgan, the fledgling partnership represents an opportunity to take his family's eco-tourism business to a new, deeper level. "We're moving the company forward in a 'green' way and want to establish a foothold in Central America to study the rain forest environment," he said. "On the ground, we have the logistical capabilities, the connections, the lodging. We want to move in the direction of research." Morgan, Blair and Farnsworth hope that the partnership will create an official Latin American biological field station for Xavier and will lead to further learning projects for life sciences students, taking advantage of the variety of ecosystems within Costa Rica's borders. If the experience this month is successful, they will offer it again, perhaps expanding the program and opening it to non-science majors and other schools. Morgan's budding relationship with the National University of Costa Rica may enable Costa Rican students to conduct rain forest studies in and around the company's Jungle Lodge. Beyond that, the three men hope Cincinnati-area companies with an interest in Central America will become involved. "This represents a significant business partnership that will create new awareness, through education, for an area that is very important to the world," Morgan said. "And these guys (Blair and Farnsworth), once they get their feet on the ground, will be great consultants." Blair and Farnsworth point out that Costa Rica is trying to balance its economic needs with its need to preserve the environment, especially since tourism is its primary industry. But loss of forests to agriculture is a problem. Morgan hopes the students will realize that the resource conflicts they see in Costa Rica have applications close to home. "Water quality has a big impact on the environment. We want to link these lessons to local water quality issues in the greater Cincinnati area, like wastewater treatment, deforestation, water use," Morgan said. "People move out to the suburbs to live in a better place, but if they pollute those environments, the suburbs are no longer a better place." Listed by National Geographic as one of the most "biologically diverse places on the planet," Costa Rica has emerged as a favorite spot for eco-tourists, and tourism now ranks as the Central American country's No. 1 industry. Recent government investment in developing high-tech capabilities has helped the country attract some computer-related, pharmaceutical and consumer products companies, but agriculture continues to play an important role in the economy, with primary crops of bananas and coffee. 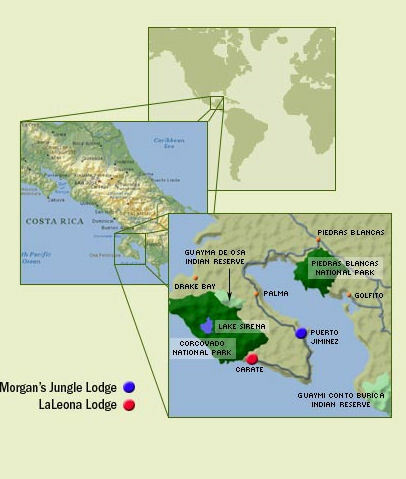 For more than 10 years, Morgan's Canoe & Outdoor Centers, based along the Little Miami River in Warren County, has operated a 20-acre Jungle Lodge and Center for Rain Forest Education near the village of Puerto Juminez on Costa Rica's Osa Peninsula. Situated directly on the Golfo Dulce and close to Corcovado National Park, the Jungle Lodge aims to give North Americans an immersion experience in a variety of tropical ecosystems - from mountain to nearshore -- and a resulting appreciation for the fragility and interdependence of these systems.